Circulation maps quickly convey complex information. Using data from your circulation system, we generate a broad set of maps depicting the actual use of your libraries. Hard facts enable you to make and implement the right decisions for your library. Whether you need to discover and demonstrate who uses your libraries, or need to educate others, maps are powerful tools. Use circulation maps as part of a one-time effort, or as an ongoing process under a yearly subscription. 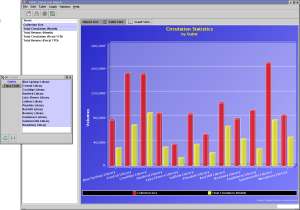 A powerful data-visualization solution providing cross-vendor support. You can quickly zoom in on the information you are looking for, producing tables and graphs, and turn ILS data into spreadsheets without tedious manual retyping.